Why are combo boards preferred to conventional bulletin displays when communicating with large groups? That’s easy. 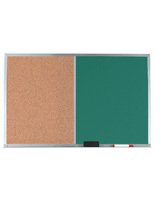 Combination corkboards, also known as affordable message centers, accommodate a plethora of communications, all in one easy-to-use enclosure! A central place for notices is essential for informing a large number of people about activities and logistics, and these combo boards meet that need, and then some. 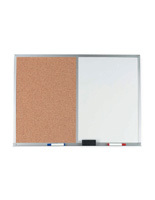 Place these wall-hanging combination cork and whiteboard solutions in a school gym, professional office, or community center entry way so time-sensitive material reaches students and co-workers quick. These message centers with varied surfaces provide opportunities to reinforce branding while distributing news. 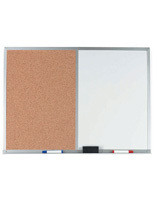 Most of these combo boards with doors include a dry erase surface plus cork or fabric for pinning notes and graphics. Each of these wall-mounted presentation enclosures are available in aluminum or wood, and both styles are understated enough to go anywhere. These combination surface frames for notices are offered at an affordable price point, without sacrificing quality. 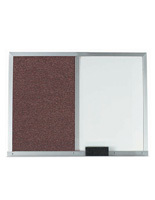 Each of these long-lasting combo boards with doors that are message centers can advertise upcoming events, new procedures, contests, logistical information, and the like. 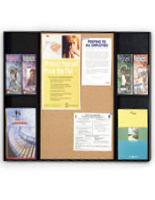 This new twist on conventional corkboards, like most quality bulletin displays, offer myriad ways for vital information to get dispensed to the public - all in one easy-to-access unit. Reinforce graphics with notes of text, or dispense brochures and newsletters alongside of a poster or collection of notices. Create visual interest with two types of displays, and never miss an opportunity to drum up enthusiasm for an event or cause! 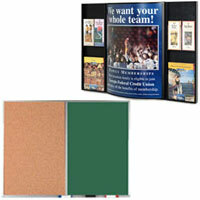 What configurations & materials do message centers & bulletin displays come in? When choosing messaging enclosures, it’s best to map out one’s communication plan ahead of time. Do trifolds need to be distributed? Is there eye-catching art work that can be hung? Are events being promoted on certain days or evenings, is help being solicited, and what notices are most likely to suit a particular audience? 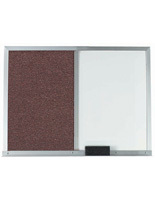 These wall-mounted bulletin displays come in vast array of styles, sizes, and configurations to address the needs of school teachers and business leaders with myriad communication preferences. Even in the age where digital information rules, manual tools such as these enclosures for posting notices have a way of grounding the message and making it sink in. The interface with the public is immediate - and word of mouth is a powerful advertising tool that comes naturally from posting in a central location in a public venue. In this line are quality enclosures with doors, which have easy-close magnetic latches to keep contents secure and safe from tampering, theft, or damage when a presentation is not in progress or the day is done. Versatile business tools such as these never go out of style. 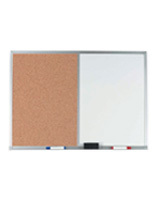 These boards are designed to work with a variety of writing tools like chalk and magic marker for whiteboard and chalkboard surfaces - use pushpins of course to post notices onto conventional cork or fabric surfaces on the other side. 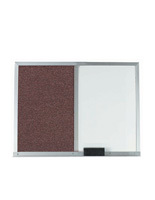 A great way to dispense newsletters or trifold brochures is with a dual-purpose board that features both cork/fabric, plus acrylic literature pockets in the corners. Sturdy aluminum or wood framing with swing-open doors is an excellent way to conceal and protect notices and supporting graphics or artwork once a presentation is finished. Poster frames have never been so versatile - dry erase/cork/chalkboard displays boost messaging impact immediately when combined. These magnetic-closure boards come in numerous sizes and configurations and they are most affordable!